Our research papers go into detail about the security guarantees, threat model, and performance of our systems. Abstract: Private messaging over the Internet has proven challenging to implement, because even if message data is encrypted, it is difficult to hide metadata about who is communicating in the face of traffic analysis. Systems that offer strong privacy guarantees, such as Dissent, scale to only several thousand clients, because they use techniques with superlinear cost in the number of clients (e.g., each client broadcasts their message to all other clients). On the other hand, scalable systems, such as Tor, do not protect against traffic analysis, making them ineffective in an era of pervasive network monitoring. Vuvuzela is a new scalable messaging system that offers strong privacy guarantees, hiding both message data and metadata. Vuvuzela is secure against adversaries that observe and tamper with all network traffic, and that control all nodes except for one server. Vuvuzela's key insight is to minimize the number of variables observable by an attacker, and to use differential privacy techniques to add noise to all observable variables in a way that provably hides information about which users are communicating. Vuvuzela has a linear cost in the number of clients, and experiments show that it can achieve a throughput of 68,000 messages per second for 1 million users with a 37-second end-to-end latency on commodity servers. 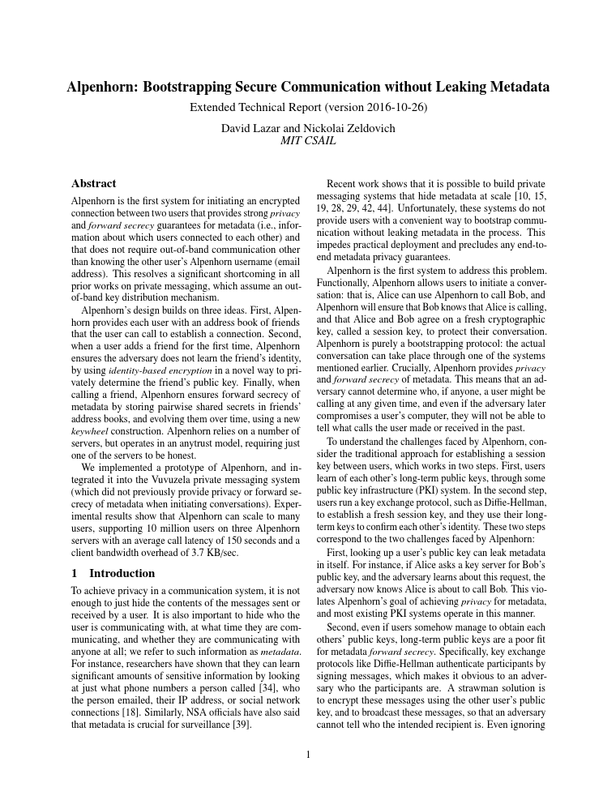 Abstract: Alpenhorn is the first system for initiating an encrypted connection between two users that provides strong privacy and forward secrecy guarantees for metadata (i.e., information about which users connected to each other) and that does not require out-of-band communication other than knowing the other user's Alpenhorn username (email address). This resolves a significant shortcoming in all prior works on private messaging, which assume an out-of-band key distribution mechanism. Alpenhorn's design builds on three ideas. First, Alpenhorn provides each user with an address book of friends that the user can call to establish a connection. Second, when a user adds a friend for the first time, Alpenhorn ensures the adversary does not learn the friend's identity, by using identity-based encryption in a novel way to privately determine the friend's public key. Finally, when calling a friend, Alpenhorn ensures forward secrecy of metadata by storing pairwise shared secrets in friends' address books, and evolving them over time, using a new keywheel construction. Alpenhorn relies on a number of servers, but operates in an anytrust model, requiring just one of the servers to be honest. We implemented a prototype of Alpenhorn, and integrated it into the Vuvuzela private messaging system (which did not previously provide privacy or forward secrecy of metadata when initiating conversations). Experimental results show that Alpenhorn can scale to many users, supporting 10 million users on three Alpenhorn servers with an average call latency of 150 seconds and a client bandwidth overhead of 3.7 KB/sec. 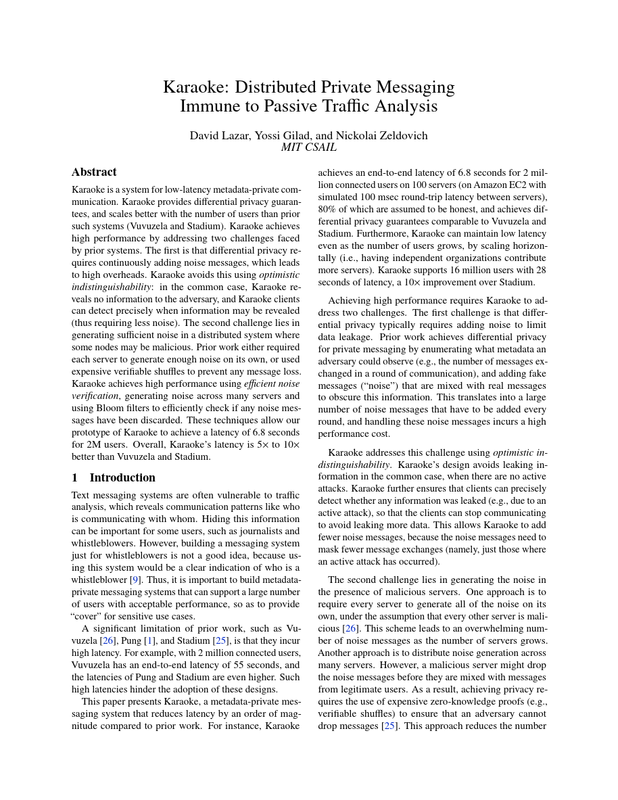 Abstract: Karaoke is a system for low-latency metadata-private communication. Karaoke provides differential privacy guarantees, and scales better with the number of users than prior such systems (Vuvuzela and Stadium). Karaoke achieves high performance by addressing two challenges faced by prior systems. The first is that differential privacy requires continuously adding noise messages, which leads to high overheads. Karaoke avoids this using optimistic indistinguishability: in the common case, Karaoke reveals no information to the adversary, and Karaoke clients can detect precisely when information may be revealed (thus requiring less noise). The second challenge lies in generating sufficient noise in a distributed system where some nodes may be malicious. Prior work either required each server to generate enough noise on its own, or used expensive verifiable shuffles to prevent any message loss. Karaoke achieves high performance using efficient noise verification, generating noise across many servers and using Bloom filters to efficiently check if any noise messages have been discarded. These techniques allow our prototype of Karaoke to achieve a latency of 6.8 seconds for 2M users. Overall, Karaoke's latency is 5x to 10x better than Vuvuzela and Stadium.